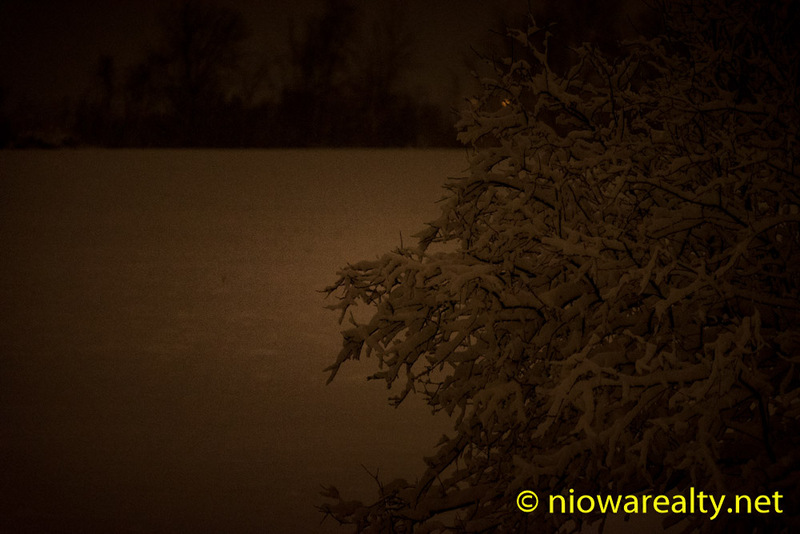 Share the post "Covered in Snow"
There’s no question many of you were spending a great amount of time dealing with the 12+ inches of snow we had at our doorsteps this morning. It was about an hour later than normal by the time I arrived at my office simply because I had to wait for the snowplow to arrive. With so much snow, I wasn’t going to risk getting my car hung up in deep snow. I’ve seen it happen too many times and it isn’t pretty. After out shoveling snow at my office for about three hours, when finally finished, I mentioned to one of my next door neighbors that I felt like I’d been in a marathon wrestling match with a Sumo wrestler. Shoveling snow really doesn’t bother me unless there’s lots of it along with being heavy like it was today. I’m sure the City will be busy these next days getting the Downtown cleared of snowbanks at our curbs. Someone said our last big snowfall took place in early February of last year. Oh how I remember that one. I actually hurt my shoulder throwing so much heavy snow that day. I didn’t realize until six months later that a shoulder injury is one of the longest healing processes. It was a good thing I didn’t have but only one appointment outside the office this afternoon which afforded me time to catch up on some needed research. It’s interesting how when seeing an awkward sale of a home take place, my suspicions of whom the likely buyers were, oft times are confirmed. There are always those bottom feeders who’re circling our City looking for an “injured animal” house or building to pounce on. It happens everywhere including right here in River City. Having found a report I received several days ago that I’d not yet read, I figured today was a good day to study it. The report contained many interesting facts about real estate sales in Mason City for the year 2016. Just as I’d suspected, there were a whopping 37 homes that sold in the $200 – $250K price range. When you think about it, that’s a large number for our City in one year. The highest number of sales were in the $100 – $120K price range of which there were 55. The third highest number of home sales was in the $140 – $160K price range which came in at 35. What are these figures telling me? Well, they’re saying there are a large number of either highly paid single buyers, or double income households that’ve decided to pull their triggers. Of the reported sales here in our City, 245 of the buyers took out regular loans. The cash buyer numbers came in at 99, and the VA and FHA financed home sales came in at 54. We’re basically looking at two-thirds of last year’s buyers getting loans while the other third paid cash. I suspected there would be a higher volume of cash sales for 2016 because I was noticing it with Holtz Realty’s sales. I thought it would be worthwhile to share these statistics with all of you. Working with two new buyers this week, it looks like January will continue to be a productive month in spite of our listings now being covered in snow.